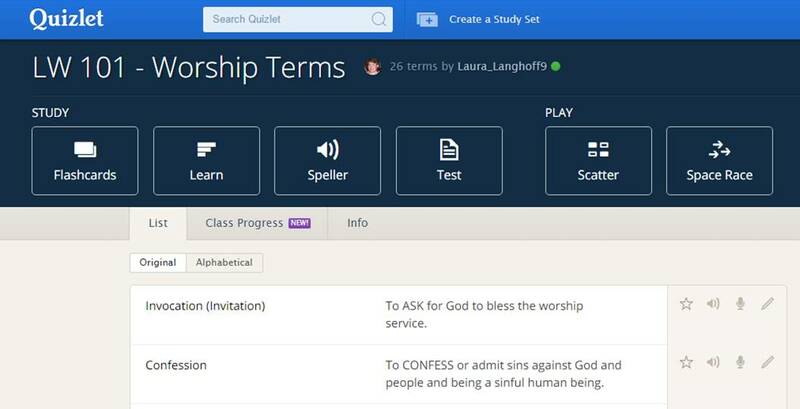 The Carpenter's Ministry Toolbox: CONFIRMATION: Ever try QUIZLET? Every once in a while I try to create some online tools for confirmation using existing programs and this time I'd like to introduce you all to Quizlet. It's a great tool for learning vocabulary and I added one for WORSHIP TERMS because I think that instead of assuming students think knowing about worship terms is boring and so not teaching them, we should do the opposite and assume they like to feel smart and be smart about their faith and what they believe. So, here's what you can do with Quizlet. Once you get to my list: LW 101; Worship Terms, you can see the different options. Of course, nobody really thinks flashcards are fun, but they are a fantastic learning tool. Students can use them to learn the term or the definition and there's an audio function that works pretty well for pronunciation. The best way to use this section is to show the definition and have the student type in the term, but it can be done the other way around too. This is actually pretty great. The definition is given and the Quizlet lady speaks the term and the student has to spell it. The test is excellent! You can decide what type of questions to which students should respond: written, matching, multiple choice, or true/false. This is a matching game. Both terms and definitions are on the screen and need to be put together. In this game the definitions scroll by and the student needs to type in the term to earn the points. How can you use this with a confirmation class? The games are timed. Put students in groups and invest in a wireless mouse. Allow each group to compete in a chosen activity. Test them using the online quiz. Show it on a screen and have them take it independently. Have a class tournament throughout the week. Sign up yourself and create your own or use my card set. The program keeps track of high scores. LEADERSHIP: A FIXED or GROWTH Mindset?